Hopkinton Drug is an integrative, community pharmacy in Hopkinton Massachusetts. This site was created to bring you select health and wellness information, provide an online shop filled with high quality health products and spread the word about our retail location. 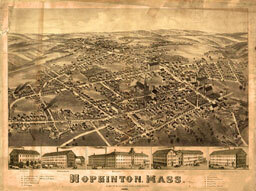 Since 1954 Hopkinton Drug has been a caring community partner in this historic New England town. We are a multi-faceted store dedicated to providing clients with an array of healthcare options. In addition to our full service retail pharmacy, we can customize medications to meet patients' specific needs in our compounding lab. We offer a comprehensive selection of nutritional supplements and nutraceuticals as well as a staff knowledgeable about those products. We also have a lactation d epartment complete with a certified lactation consultant, lactation supplies and breast pump rentals and sales. We have a large orthopedics, durable medical equipment and incontinence section as well as professionals ready to assist you in these areas. Recently we have begun an immunization program. We run vaccination clinics here in our store as well as an off site program. Select pharmacists, certified in vaccination, are out in the community bringing vaccines to businesses and organizations. For more information see our vaccine page. Upstairs, in our 6,000-square-foot card and gift store, you will find more than just greeting cards and wrapping paper. Our gift store has gifts for all ages, occasions and price ranges. I have been having my son's compounded Prilosec filled at Hopkinton Drug for 4 years and have NEVER had a problem. In fact, the one time that I forgot to call in my compound with 24-hr notice, they rushed it for me. They have always been wonderful. Also, their gift store rocks with cute little toy bins, art supplied, and great quality toys. My kids BEG me to take them. It is just an old fashioned fun store. They also carry essential oils and offer great lecture series. This is a long overdue thank you note for making the mouth rinse for my mother during her chemotherapy. It was really a great help to her and allowed her to heal much more quickly than she would have without it. Many, many thanks! I want to thank you for the last two medications. I think they are working well. My tummy and legs are beginning to show my hair. Thanks for much for the Rx's. Mommy and I are very happy and I am grateful for your knowledge that gave me your Rx's. Much love. Thank you so very much for your help with my pain - it is so appreciated and certainly a lovely welcome occurrence to work with such competent, helpful people. You have saved my feet. I had to purchase some replacement test strips for my diabetes testing meter, and had the opportunity to speak with Ralph about alternatives. He explained that the strips I was using were terribly expensive, and not reimbursable under our insurance. HE recommended a different model testing kit, which would save me about 60% on testing supplies. He ordered a kit, and took considerable time to explain the system to me, and to check with the manufacturer. I realize this may fall within his job description, but I think we went "above and beyond." I really just wanted you to know that I appreciate the local nature of your business, and the people who work there. My husband and I were desperate last Wednesday when we saw that our 18-year-old cat was declining very rapidly from her heart and kidney problems. We did not think she was going to see her 19th birthday in a few weeks. Thanks to your rapid compounding of Pimobendan, she began to improve immediately, and has continued to take her medicine eagerly twice a day. Now we are almost certain that she will indeed make it to her birthday, and beyond. Thanks again for the wonderful work you are doing, for animals and for people. I received the 30mg fexodenadine capsules you compounded for me on Saturday. Thank you, thank you, thank you! Ever since Allegra stopped making the tablets in 30mg strength, I've had to use the meltable, nasty tasting things that contain aspartame. Not only did the lovely after-taste bother me, but the aspartame makes my mouth sore. It is so nice not to have to deal with that! I had called a number of compounders but couldn't find any that would do this. I so appreciate your service and your price. I probably shouldn't tell you that the cost per pill is less than over the counter! It may seem like a small thing, but it makes a huge difference to me! Thanks again for your excellent service! I'll pass your card to all my physicians in case they have other patients with other sensitivity needs.